Following on from the success of our installation in the Shenyang Conservatory of Music, Rodgers and MPOS were commissioned to build an instrument for the new recital room in the Central Conservatory of Music - Beijing's premier music academy. The brief for the pipework was unusual, with the given space being very wide (stretching the full width of the stage), but barely six feet in height. Further, the compact nature of the room meant that it was important to scale and voice the pipes carefully, so that instrument would give a full, rich, exciting sound - enveloping the listener, but without ever sounding harsh or forced. MPOS's solution was to design a sweeping, asymmetrical display of 12 ranks of speaking pipes on slim, modular windchests, with a slender wind regulation system designed to site vertically amongst the pipework. 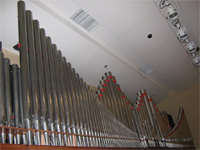 Pipework forms the basis of the Great diapason chorus and the Positif flute chorus. Due to the height constraint, the Great 8' Open Diapason includes pipework down to tenor C (4' pitch) and a digital bottom octave, with the pipes and digital notes voiced as a single entity. In April 2009 the MPOS team (consisting of Mark Booth, David Wilson and Paul Mortier) travelled to Beijing to install the pipes and interface them with the Conservatory's new Rodgers custom T1038 four-manual console, working in partnership with Rodgers Hong Kong agent Mr Amos Ho. Voicing of the entire instrument was carried out by David Wilson, Tonal Consultant for MPOS. The classical organ is still little known in China, and this instrument was a gift to the Conservatory from Mr Ikutaro Kakehashi, founder and Special Consultant of the Roland Corporation. Mark Booth of MPOS said "it was thrilling to have the opportunity to build this organ, and we hope it will inspire many generations of students as they discover the excitement of playing the 'king of instruments'!"